It doesn’t matter how you dance, just how you feel while you’re dancing. Our GroovaRoo Classes are judgement-free zones that foster love and connectedness. Our Certified GroovaRoo Instructors are there to help you feel comfortable and confident while bonding with baby and having a blast! Gently support baby through the fourth trimester and beyond through movements and feelings that remind them of the womb. They are just beginning to discover the world, and you are their safe place. Foster a secure attachment with your child, while improving your mental health and well-being and connecting with other caregivers who support one another on the journey of parenthood. A child’s environment from conception through their first 1000 days of life has a significant impact on their physical, social, and emotional development. This directly affects the way they relate to others and the world around them later in life. It is our goal to create a healthy, loving, supported environment for child and caregiver(s), forming bonds that reach far beyond the GroovaRoo classroom. 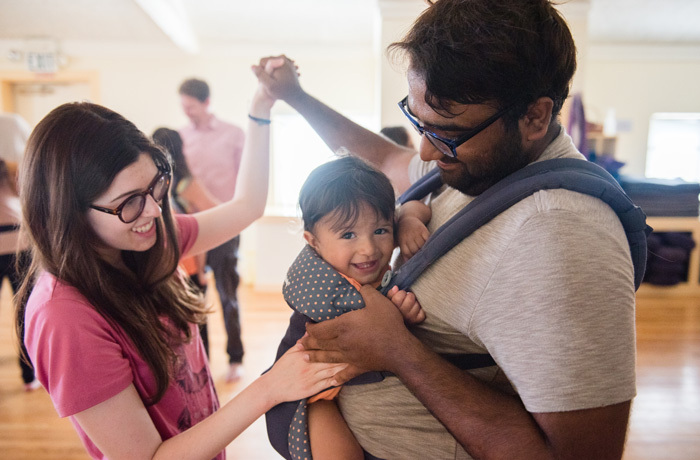 Tailored for caregivers with babies from 3-18 months (or as long as baby is comfortable being worn), our GroovaRoo babywearing dance classes are appropriate for all levels of dance experience, including beginners.